Health care experts estimate that 37 million Americans are affected by sinusitis every year. In addition, health care workers report 33 million cases of chronic sinusitis to the US Centers of Disease Control and Prevention every year. Furthermore, Americans spend billions of dollars each year for medications, either over the counter or prescription that promise relief from their sinus symptoms. Let us attempt to demystify the often misunderstood topic of sinus congestion, sinus headaches and sinusitis. The Sinuses are air cavities in the human body, in this case the skull. The cavities next to the nose are called paranasal sinuses and are the ones that bother most people, when they say they suffer from sinus congestion and pressure. Frontal Sinuses—overly the eyes in the brow area. Maxillary Sinuses—directly underneath the cheek bones. Ethmoid Sinuses—found directly behind the bridge of the nose and between the eyes. 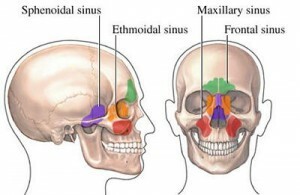 Sphenoid Sinuses—found behind the ehtmoids in the upper region of the nose and behind the eyes. Each sinus has an opening, called an ostium, into the nose which serves to exchange air and mucus produced. The opening is joined to nasal passages by a continuous mucous membrane. Anything that causes a swelling in the nose such as an infection or an allergic reaction, can affect the sinuses. When air gets trapped within a blocked sinus, along with pus or other secretions, it can cause pressure on the sinus wall. Also, if air is prevented from entering a paranasal sinus by a swollen membrane at the ostium, a vacuum can be created which also causes discomfort. Check out for more Information on Sinusitis Symptoms and Treatments.